The head of Canberra Metro believes the light rail project is still on schedule for an Easter Saturday launch despite it still needing two major accreditations. File photo. 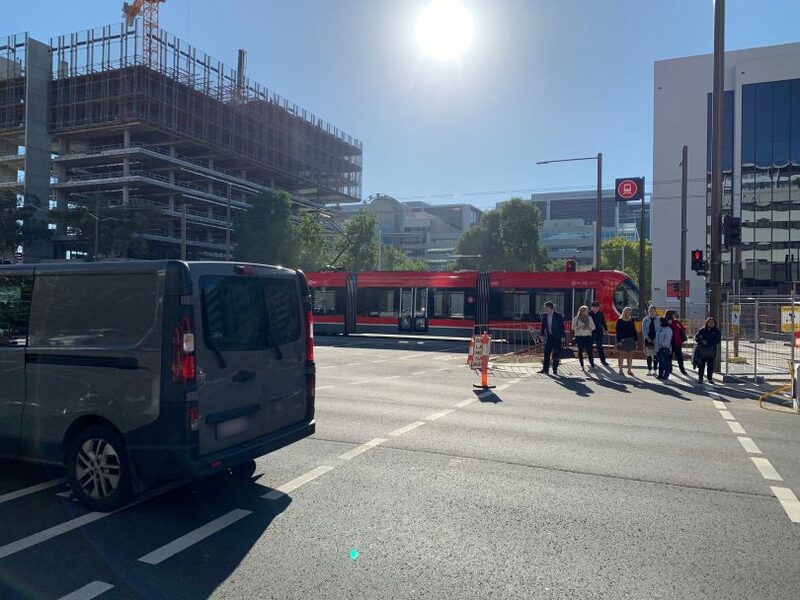 The head of Canberra Metro believes the light rail project is on schedule for an Easter Saturday launch despite it still needing two major accreditations and this week’s replacement of 10 metres of track near Nullarbor Avenue. Canberra Metro chief executive officer Glenn Stockton said he is confident of achieving the accreditations required in time for the April 20 community launch and this was “always expected to occur at the back end”. He said the ripping up and relaying of track near the new Nullarbor stop which was completed yesterday (April 9) was due to a drainage issue rather than a safety issue, with work aimed at preventing passengers from getting their feet wet. “We weren’t happy with the way the levels came through and, as a result of that, if you were a pedestrian crossing the intersection in the vicinity of the stop at Nullarbor you’d probably get your feet wet and that wasn’t a satisfactory outcome for us,” Mr Stockton told ABC Canberra’s breakfast program this morning. “It wouldn’t be a satisfactory outcome for Canberrans and as a result, we made the choice now to take action and fix it. Mr Stockton said Canberra Metro made the decision to relay that section of the track now, despite it being so close to the launch, rather than “risk doing that during revenue service when people are looking to use the light rail”. Mr Stockton said the light rail project still needs two accreditations before the launch. One of these is an accreditation to take passengers on light rail from the Office of the National Rail Safety Regulator and the other is a licence from the Utilities Technical Regulator to operate the network. “We’ve created an electrical network as part of the project. We’ve energised high voltage wires to provide traction power to the trams and provide power to the stops and those sort of things,” Mr Stockton told ABC Canberra. Mr Stockton said Canberra Metro is working closely with the regulatory authorities to achieve the accreditations and he expects to have them in time for starting operations. “It was always expected to occur at the back end and that’s a process of the life cycle of a project, particularly one that requires such accreditations,” he said. “We’re very happy with the way the system’s performed and we’ve done a couple of new things on this project. Light rail from Gungahlin to the City will officially open to the public on Saturday, April 20 with free travel offered to encourage the community to try it out. Light rail from Gungahlin to the City is scheduled to officially open to the public on Saturday, April 20. File photo. Canberrans are being asked to leave their cars at home and take advantage of free buses that will run across the network to get people to and from the City and Gungahlin terminals. 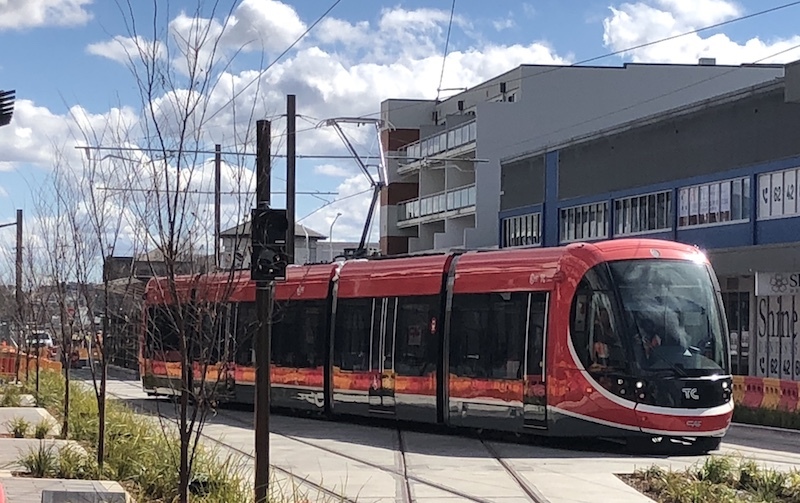 Three-hundred Canberrans who won spots through a public ballot will also have the opportunity to board a vehicle and preview the light rail experience on April 18, two days before the rest of the public. So, they don’t have plans to even out the nasty bumps cars encounter at the Wakefield Avenue intersection. So bad they previously had a warning sign on them. The noise that will make (thump, thump) will put a premium on the prices for units at that intersection. Buyers will be fighting each other to be in earshot of the true aural wonders that result from tram lines intersecting with roads on an uneven plain. Free busses, free trams but leave your car at home. How prophetic.